When there's lots of talk of war in the news, it's a very natural response to wonder, is peace possible, and who is the peacemaker? I tend to react instinctively, and say that peace has to come from within, that one must learn how to be peaceful from a special place inside. But it's not that simple. Even as individuals we feel anger, and that anger festers inside, and somehow has to work its way through us, or outside us, it may have to create depression, or we may have to get angry and express it. Then it's over, like a storm it's over. I suspect that wars are like that. Some kind of emotional/spiritual toxicity develops, and there may be no way to avoid releasing it, which appears totally irrational and crazy while it's happening. So how can there be peace? I don't have an answer. If I look to ancient teachings, like the Bhagavad Gita, there is a war between two groups, two families that know each other well. 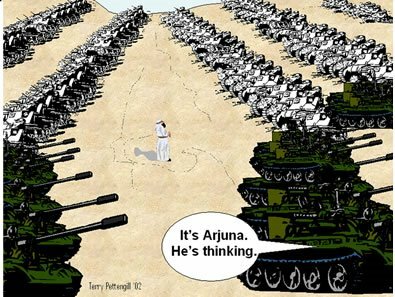 Arjuna and Krishna are in the field of war, and Arjuna says to Krishna, "Take me to the middle between the two armies." And for a moment, time stands still, and they contemplate the 'reality beyond the relative reality' of everyday life with all its killing. And Krishna says to Arjuna, "You know these people cannot really be killed. They always have been, and always will be." Yet Krishna also says to Arjuna, "You must fight, because that is your destiny." It may be our destiny to fight and to kill, who knows? We are only human, after all. If even the gods must fight, perhaps we must too. Yet if there is ever peace, then that peace must have been our destiny too. Ultimately we may have no choice, but we have the very real illusion of choice. We can choose war, and we can choose peace. Who is the peacemaker? He or she who makes the peace. While holding a corporate job, I decided to start a healing arts center. It was my first business start-up. It seemed a worthy cause – to promote holistic health and healing practices. My wife and I saw ourselves as healers. Unfortunately, I was not ready for the “busyness” of business. I became overwhelmed with organizing, marketing, and money. In the end, I could heal no one, not even myself. My peace of mind was completely shattered. Something was wrong. I dropped the healing center and began a deep self-examination. I had gone through the basic problems of economic society – a complex world with many demands. Nothing is done in isolation. Government regulations, financial issues, marketing and sales – all these and many more issues had to be addressed in starting and maintaining a business. Most start-ups don’t last more than a year or two. Parents and spouses usually want you to go to work for a solid company with a regular paycheck. For those deep in the culture of entrepreneurship, having a packed calendar of appointments is almost a sign of status, a sign that you are making progress. Yet, when I look back upon such times in my life, I can only wonder at all the time and energy used up. Had I been wiser, I would have done less and gotten a more solid sense of achievement. I was overbooking myself. Now, I see myself in a society that is overbooked all around, with not enough time for real human value in all the getting and doing, in the midst of plenty. The madness of too many things to do will make you forget who you are. (That is what losing your soul is about.) Every moment is the first & last moment of your life. Your entire life comes to a head at this very moment. "In our every deliberation we must consider the impact of our decisions on the next seven generations." I have grandchildren, and am young enough to possibly see great-grandchildren. For me, leaping to 300 years or seven generations is getting easy. Today's "little" actions impact our children's children. Our immense intellectual powers look into the edges of space-time, and with powerful computers model the trends of global warming. We cannot play deaf and dumb without seriously denying responsibility. Environmental changes are slow. Mothership Earth is going down, but most of us don’t see or act upon it yet. The way to "humanely" kill a calf is by placing it in a vat of water and slowly turning up the heat. Eventually, the water gets hot enough to kill the calf without the calf noticing how hot the water really is. This will be humanity's fate on earth. There are thousands of little, personal decisions made everyday that determine the next 300 years. Drive the car? How far? What kind of car? What is the fuel efficiency? Can we walk when possible. Do the office email at home rather than commuting to the office. What kind of paper products will we buy? How many children shall we have? How big a house? A second house? Do we need to fly somewhere for a vacation? Are there ways to feel wealthy without consuming mother earth? The developed world is encased in technology. The solution is now more cultural than technological. Let’s breath free again. It's time for a great re-tooling, re-valuing of how we live, think, and exchange goods and services; time for a true revitalization of civilization along more human and earth friendly lines.